Sound check is at 7:15pm and I arrive at Bon a few minutes early. Jen and Joel Jones, the founders and producers of Big Blue Door, are setting up chairs and selling tickets, Lewis Reining is checking the sound (and probably practicing the story he will also tell), and the ballots are stacked on a table by the door, waiting for the first 50 attendees to pick them up. 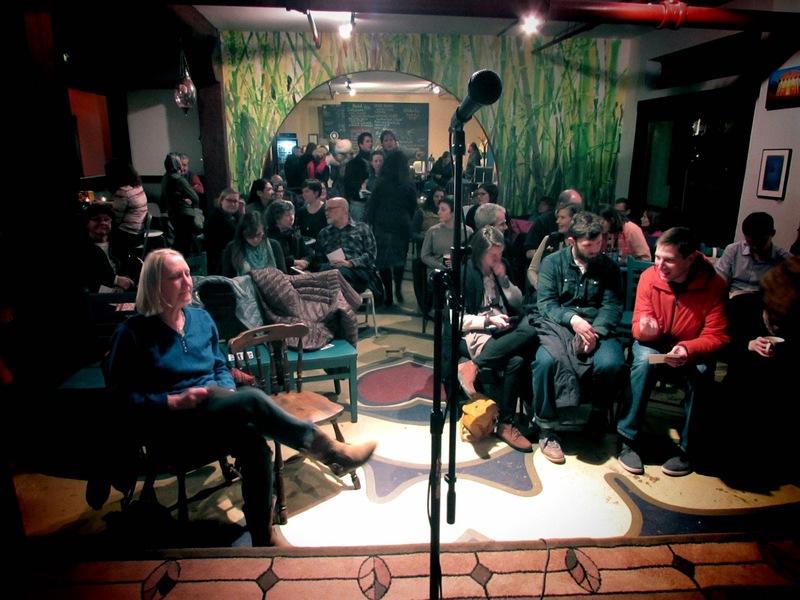 Once the show starts, the audience will listen as the eight storytellers who received the most votes during the Fall 2014 season tell stories lasting from six to eight minutes. 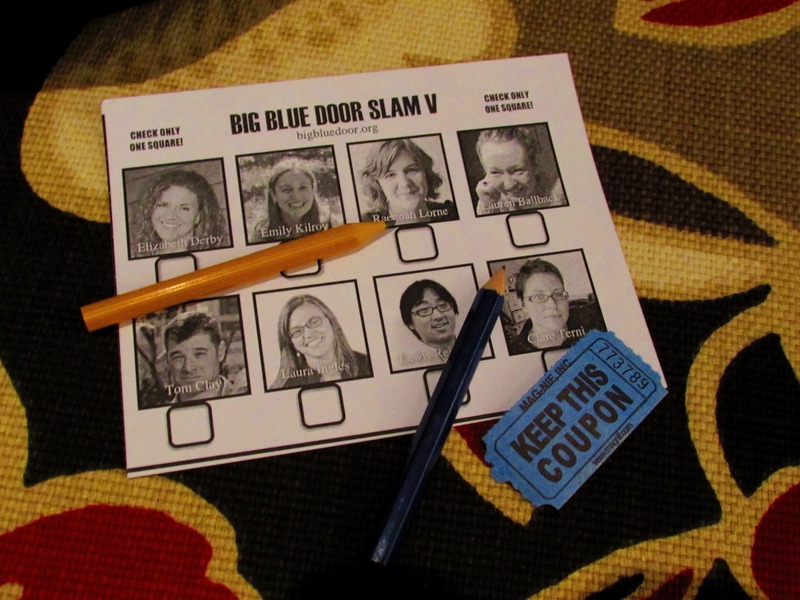 At the end of the night, the audience will vote on the best storyteller—the next Slam Grand Slammer—to take home the prize: a wooden trophy topped with a (little) blue door, made by Joel Jones himself. The runner-up will take home a loaf of Wonder bread, to go with the Big Blue Door jam (really grape jelly) s/he may have won previously as a Big Blue Door Jam winner. 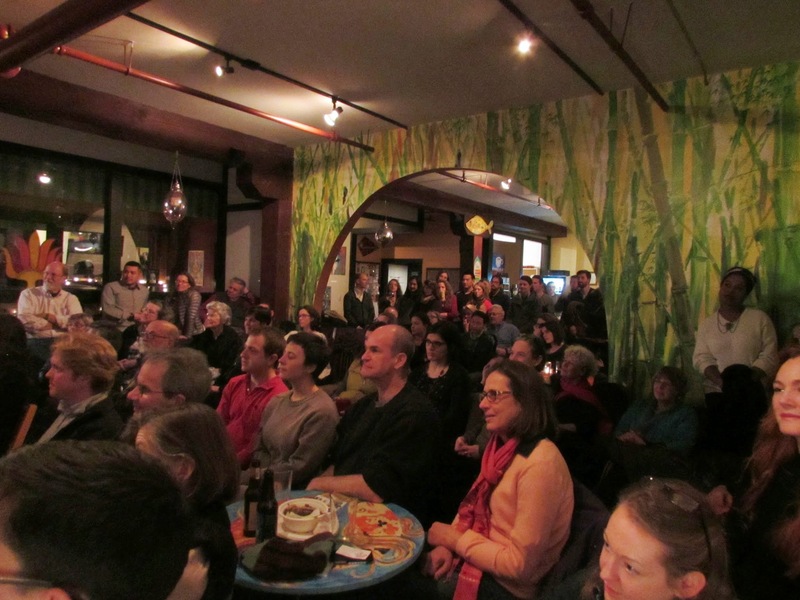 By the time the Slam starts at 8pm, there is standing room only—about 80 people in attendance, and more are being turned away at the door because Bon has reached capacity. If you’re a newbie storyteller like me, this is a little terrifying. One of the things that lessens the terror is knowing where you are in the lineup. At the Jams, the emcee draws the storytellers’ names out of a hat at random. But at the Slam, the producers create the lineup in advance. I’m the second storyteller after intermission, which means I have enough time to completely forget my own story while the other storytellers draw me into their own, and then stare at a wall during intermission, reciting it to myself. The night’s theme is “Don’t you forget about me.” The stories range from tragic young death to dementia and life after death, from mothers and childhood companions to first boyfriends and traumatized lovers. During each story, a volunteer somewhere in the back shakes a soft rattle at minute seven to let the storyteller know his or her time is almost up. In between stories, the talented emcee, Yousaf Sajid, entertains with anecdotes of his own. Following the last story, after an evening of much laughter and some tears, Yousaf tells a hilarious story about dancing alone at a wedding surrounded by couples, while Jen and Joel tally up the votes. Clare Temi wins the title of Slam Grand Slammer for her story about her family’s Catholic funerals and her grandmother’s lasting presence, and Elizabeth Derby takes home the loaf of Wonder bread for her story about her favorite stuffed animal: a seal named Snowball she fell in love with in the Sears catalog. 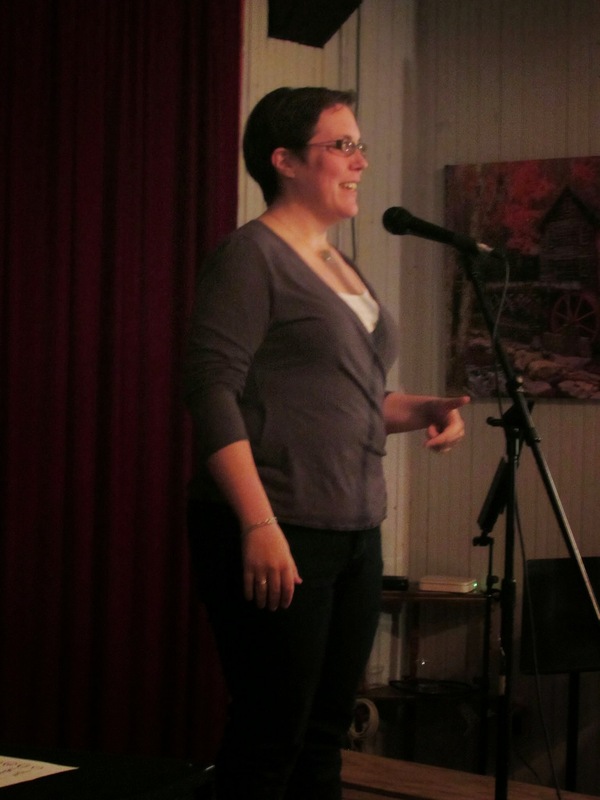 When you attend a storytelling Jam or Slam, it becomes so readily apparent that Big Blue Door is providing an important outlet in the community that it is amazing to learn it has only been around for three years. While Joel is a Charlottesville native, he and Jen had previously lived in New York where Joel was part of a storytelling group called Campfire Stories. When they moved back to Charlottesville, they learned that a storytelling group called Secretly Y’all had existed here before moving to Richmond in 2010. 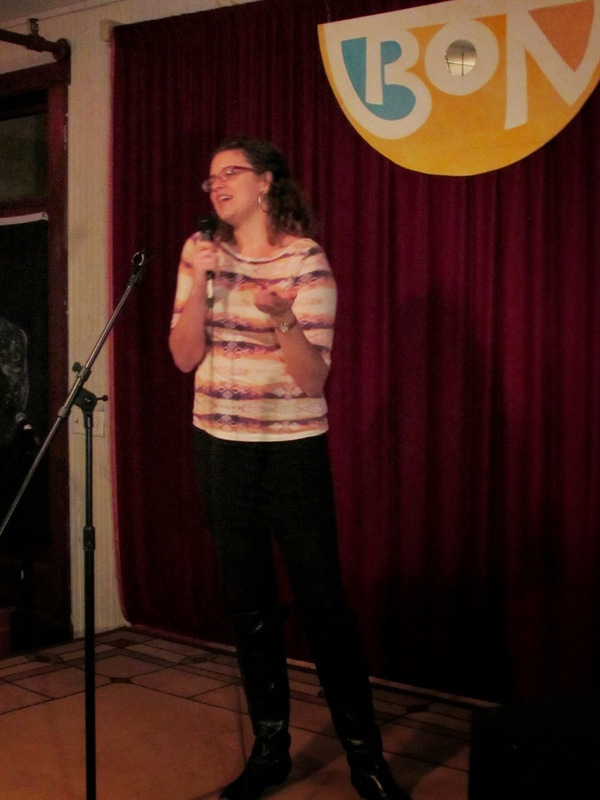 Jen and Joel reached out to them for names of local storytellers in order to launch their first show. In putting the shows together, Joel says, they borrowed from various other storytelling shows, including the moth. 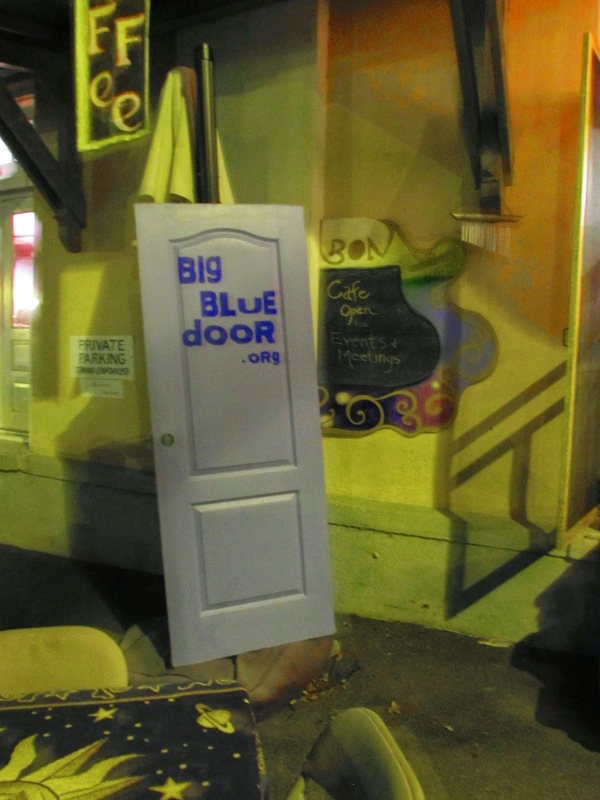 I first began attending Big Blue Door Jams when one of my friends became a storyteller. Then, in the fall of 2013 Joel offered a Telling True Stories class and, as a writer afraid of public speaking, I decided to sign up. 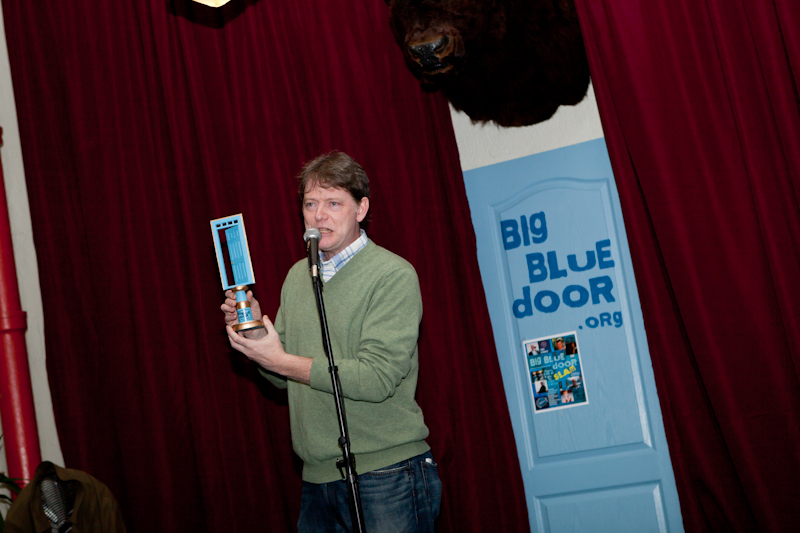 Since then, I’ve participated in two Big Blue Door Jams, which are usually held at C’ville Coffee, earning in October the Big Blue Door keychain first-time storytellers are honored with at their first Jam. Following the success of the Big Blue Door Story Slam V, Jen and Joel will be seeking out more guest hosts and producers, compiling a printed collection of stories, and trying to secure a permanent studio for classes. They hope to produce the next Jam in April. 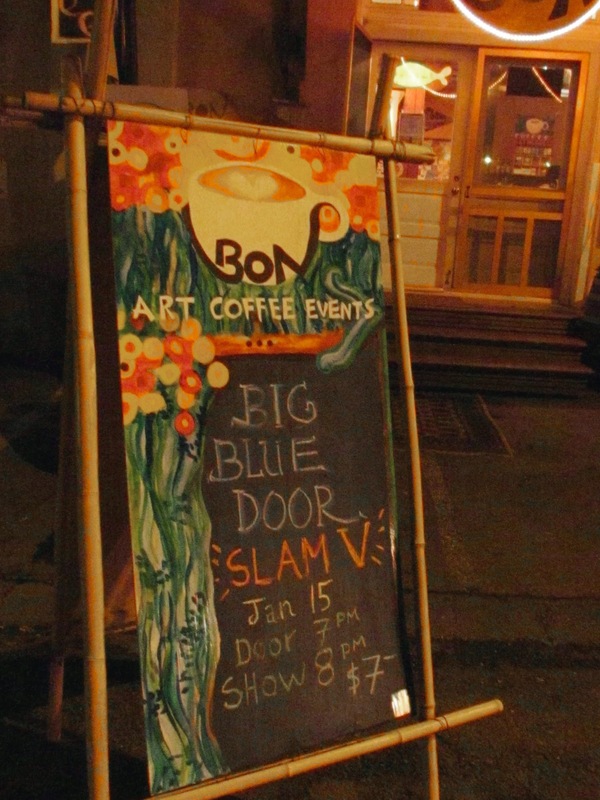 But if you need a Big Blue Door fix in the meantime, you can catch their longform improv shows at Bon on the second Thursday of the month, and at Cville Coffee on the third Thursday of the month. If you want to sign up for Joel’s next Telling True Stories class, which begins in March, you can find all of the information on the Big Blue Door website. If you’re interested in telling a story for Big Blue Door, do it.